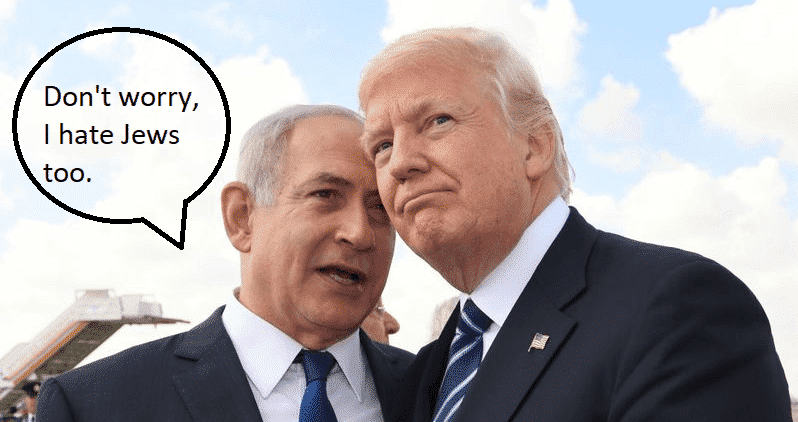 A radical leftist group Jewdas has published a vile piece claiming – wait for it – that Israeli Prime Minister Binyamin Netanyahu is antisemitic according to the IHRA working definition of antisemitism. World leaders have been criticised for sharing a platform with known antisemite, Benjamin Netanyahu. Donald Trump, Angela Merkel and Theresa May have all come under fire for meeting the notorious Jew-hater and prime minister of Israel. The Israeli Prime Minister, self-styled as ‘Bibi’ has become notorious worldwide for Jew-baiting, racist stereotyping and Holocaust minimisation. Among the definitions given by International Holocaust Remembrance Alliance is “denying the facts of the genocide of the Jewish people at the hands of Nazi Germany and its supporters.” In 2015, Netanyahu famously claimed that Hitler didn’t really want to murder the Jews, but only did it because the Palestinian Grand Mufti of Jerusalem told him to, contradicting the facts of the Shoah and minimising the Nazis’ guilt. Only last month, the Yad VaShem condemned Netanyahu after he absolved Poland of any guilt as part of a trade and recognition deal. In a statement, Netanyahu gave support to Poland with their law that made it illegal to talk about Polish concentration camps or Polish complicity in the Holocaust, punishable by three years in jail. He denied Polish complicity and even minimised their pogroms, in a statement so egregiously untrue that even Naftali Bennett condemned it. Because of Netanyahu’s record for Holocaust denial, every world leader who has met with him has been deemed to share his unconscionable views. “When will Theresa May resign?” asked Rabbi Geoffrey, in a statement backed by religious leaders from Slough, Milton Keynes and Inverness. Another of the IHRA definitions that Netanyahu has serially flouted has been “accusing Jewish citizens of being more loyal to Israel than to their own nations.” Indeed, Netanyahu has repeatedly insisted that Jews have no place in Europe. 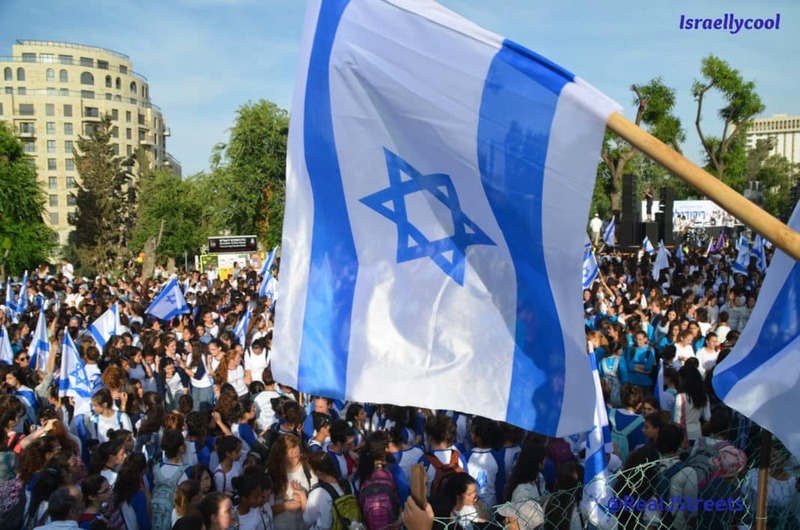 After the Charlie Hebdo attacks in 2015, Bibi told French Jews to “come to their real home” in Israel. In the same year, after a sickening attack on a synagogue in Denmark, Netanyahu repeated his claim that Jews really belonged in Israel. At the time, religious leaders on the continent criticised Netanyahu for playing games in the build-up to an election. Rabbi Geoffrey was among them, having said “it is now asur for anyone to look Netanyahu in the eye without spitting on him.” Since then, Donald Trump, Emmanuel Macron and Theresa May have all met with Bibi and none of them spat on his face. This has prompted serious questions in the community about whether these premiers really hate Jews. Netanyahu has hit back at these accusations. “OK I may have broken a couple of the IHRA examples, but they’re only guidelines and I didn’t break all of them. For example, I never called for the killing of Jews in the name of an extremist view of religion,” Netanyahu said at an IDF recruitment drive in the south Hebron hills. While this is clearly satire, it is simply disgraceful. It minimizes real Jew hatred. Plus try telling the commenters to the Facebook post that it is satire. They fully agree with it. In case the name Jewdas rings a bell, you may remember that they were the group that held an antisemitic seder attended by Jeremy Corbyn. You remember – the one that expressed a desire that Israel be destroyed, and which mocked Judaism. Perhaps their friendship with Corbyn is why they decided to write this piece. You see, Corbyn is under attack partly because his Labour party won’t adopt the IHRA definition of antisemitism – probably because, unlike Bibi Netanyahu, he and others would be found to be antisemitic under that definition.